Witch King Swords from the Lord of the Rings. 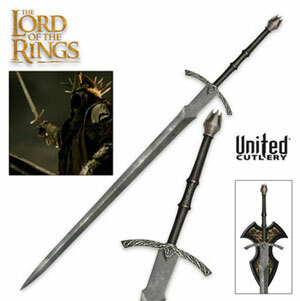 This officially licensed reproduction sword from The Lord of the Rings trilogy is the sword of the Witch King. The Witch King was the leader of the nine Ringwraiths known as the Nazgul. Once mortal and a king in his own right, the Witch King was corrupted by the power of the One Ring and now serves the evil dark lord Sauron. This sword measures 54 5/8 inches overall, and offers a 39 3/4 inch tempered 420 stainless steel blade. The hilt features a genuine leather-wrapped handgrip with solid metal cross guard and pommel in an antique metal finish.